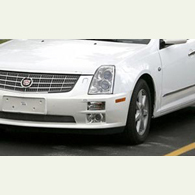 (autoinsidernews) Spy photographers caught this undisguised prototype of the Cadillac STS cruising in the Western U.S., but this isn't the STS for North America. We have seen prototypes before, including an STS-v but this is the first time that we have seen the car without any camo. Based on the large license plate area up front and unique badge in the rear, World Car Fans says this is an STS for the Chinese market, reports Trend. While this exact car isn't for the States, it indicates what's to come for the 2008 model year, including a refreshed Escalade-style grille featuring more mesh, and a reshaped rear fascia, with Euro-style clear lenses for the LED taillamps and an interesting pair of lights between the exhaust tips.